A key agreement was signed yesterday in South Korea by representatives of 172 nations, including Bahrain, in a bid to end war and establish world peace. The Unity of Religion Agreement, put forward as part of the three-day Summit for the World Alliance of Religions Peace (WARP) in Seoul, acts as a pledge by its signatories to work towards peace in their own countries and put an end to all conflict. It has also been endorsed by high-level Muslim, Christian, Bah‡'’, Buddhist, Sikh and Hindu religious leaders present at the summit, which is being organised by the Seoul-based Heavenly Culture, World Peace and Restoration of Light organisation. Manama Centre for Human Rights founding member Deena Alladhi told the GDN that Bahrain's signing of the agreement showed it was "united with the global community in working towards world peace." 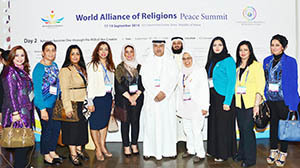 Meanwhile, Dr Amal Al Jowder, a senior member of the Bahrain Association for Religious Co-existence and Tolerance, also present at the event, vowed to promote the agreement's message once she returned home. "In the past, we have organised conferences, where religious leaders from different faiths gathered for peace and to empower the youth," she said. "All members of the Bahrain delegation taking part in this peace summit in Seoul have signed this document, which reflects our clear intention for peace and progress in our kingdom," Dr Al Jowder added. Following the signing of the agreement yesterday, a group of former presidents, elder statesmen, international judiciary members and youth leaders joined together to propose the enactment of an internationally-binding law that bans war and promotes world peace. Representatives from 28 different countries signed this proposal, while others pledged their support in backing the movement. A number of plenary sessions were also held yesterday on the sidelines of the summit, with political and religious leaders discussing the promotion of peace, cessation of war and inter-religious dialogue - as well as a special session on the role of women in world peace. A Peace Walk will be held at the World Peace Gate in Seoul Olympic Park marking the final day of the conference.